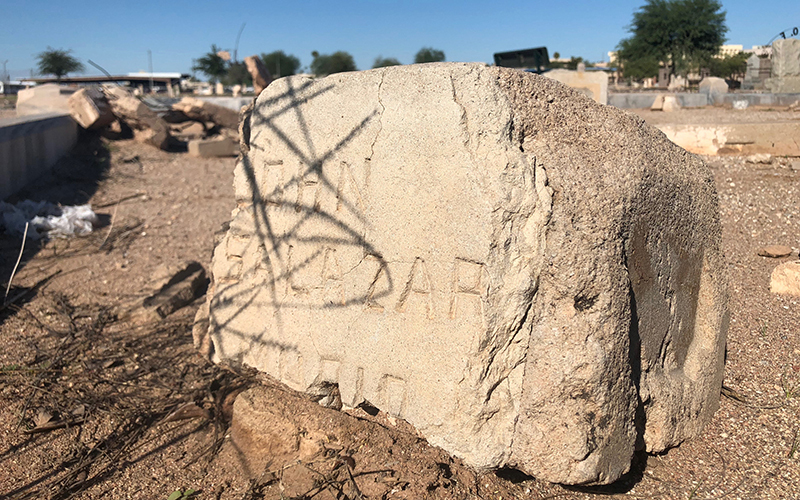 PHOENIX – Under mounds of rubble, overgrown weeds and scattered trash lie the remains of more than 300 Mexican pioneers who helped build Phoenix around the turn of the 20th century. But few people even know they are there. With not a single headstone visible, this nondescript acre of land near 12th Street and Broadway Road is the Sotelo-Heard Cemetery, where the earliest recorded burial dates to 1896. Bounded by buildings to the north and east, it sits between the ASU Prep Academy and the Salvation Army’s Ray and Joan Kroc Center. Sebastian Gomez, who lives nearby, said the cemetery has been trashed over the years. “I’d often see people riding their motorbikes and running across the field, throwing rocks and messing around. I don’t think they had an idea of it being a cemetery,” he said. The Pioneer Cemetery Association’s mission is “to conserve and protect the historic physical remains, grave markers, artifacts, and buildings of Pioneer & Military Memorial Park and provide a safe, accessible community resource for present and future generations,” according to its website. 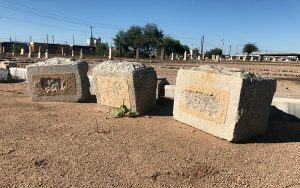 The association and other organizations have worked to preserve historical cemeteries, including Sotelo-Heard, by salvaging damaged headstones and placing them at the Pioneer & Military Memorial Park on West Jefferson Street for protection. Frank Barrios, a member of the association’s advisory board, said Sotelo-Heard is the final resting place of many young children. Most of them were from the families of Mexican fieldhands and laborers who lived in the area. Ellie Roman of Litchfield Park has extensively researched her ancestors, finding out that several are buried Sotelo-Heard, a cemetery she had never heard of before. The cemetery’s condition left her heartbroken. “I was really, really surprised that we had so many family members there. But it made sense. They were ranchers, laborers, they worked the Heard ranch,” Roman said, referring to the Bartlett-Heard Land and Cattle Co., a huge alfalfa, citrus and cattle operation that once stretched from the Salt River to South Mountain. The nonprofit organization Trellis has owned the cemetery for years. It had plans to build low-income housing on part of the property before the Great Recession began in December 2007. “Unfortunately, the market crashed and to this day we have not built anything, but we have just maintained the land,” said Patricia Garcia Durante, president and CEO of Trellis. Both the Pioneer Cemetery Association and Trellis have proposed improvements that will cost thousands of dollars. These improvements include erecting an iron fence along the south and west sides, building a monument with the names of the people who rest there, and adding an entrance to the cemetery on 12th Street. Representatives of the association and Trellis say they want Phoenix to take ownership of the land and maintain the cemetery, but they first need help from the community to fund the repairs project. Barrios said Sotelo-Heard represents an important part of the city’s history, and he hopes it will be kept alive. “Phoenix wouldn’t be what it is today if it wasn’t for those people who were the foundation of the city of Phoenix,” Barrios said.